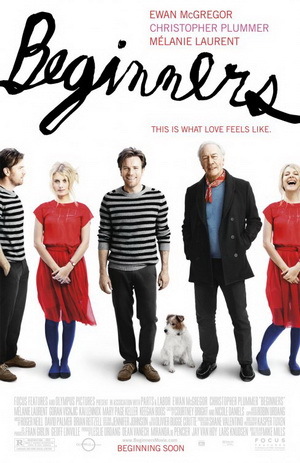 Beginners is the sort of movie that I’m required by law to love, but I couldn’t. Emotional distance is a huge factor in too many contemprary movies: fundamentally broken characters who don’t care about fixing themselves, choosing instead to fixate on their moping don’t make for particularly interesting movies. This is not to say that you can’t make films about depression or depressed characters, just that, like any other film, you should work on making them engaging in at least some regard. That Beginners tells such a personal story makes its distance unforgivable. Oliver (Ewan McGregor) is recovering from the death of his four years out of the closet father Hal (Christopher Plummer).He meets Anna (Mélanie Laurent, who still hasn’t learned to pick them after Inglourious Basterds), an actress, and they kind of have a relationship but kind of don’t. The film features parallel story lines of the last months of Hal’s life and the beginning of Oliver and Anna’s relationship. Mike Mills wrote Beginners in response to his own father’s coming out. You would think this would endow the movie with a degree of feeling, but it doesn’t. The whole exercise is remote. Oliver’s mother is represented in flashbacks reminiscent of Harold and Maude; Oliver tries to trace his melancholy to his parents’ presumed loveless marriage, but the answer is much simpler: he’s a sad sack, endlessly waiting for a lion. It’s easy to blame your parents for everything, especially when you deliberately don’t seek parts of the story that make sense of their emotions and actions. The childhood flashback sequences of this movie don’t particularly prove anything except that Hal felt absent and Oliver misses his mother. These scenes are quirky but offer little. The film’s whole structure doesn’t make much sense; the parallels aren’t easy enough for us to draw, and what Oliver is doing always feels the same regardless of whether his father is alive or dead. Periodically the film is broken up by Oliver’s illustrations of the history of sadness. These are for his job, where they prove profoundly unsaleable. They were drawn by Mills himself, and they seem too pithy to really reflect what is supposed to be fighting to release itself from Oliver. At other times the film tries to force collages of “these were the days”, utterly failing to set the scene and continuing to take the audience further and further away from the film and from Oliver himself. Ultimately Oliver’s depression becomes the entire content of the film: that his father was gay and died seems incidental; that he can’t connect and commit to a potential girlfriend is symptomatic but irrelevant. Depression can feel like your life has become a total blank, and largely meaningless to you. It can be frustrating. Oliver is undeniably frustrated; he can touch but he cannot feel. Mills has injected this melancholy into the very marrow of Beginners, resulting in a film that is bland and tasteless. It’s disconcerting to feel this disconnect: dead and dying parents are supposed to be a safe way to get audiences to discover their emotions. Christopher Plummer attacks the role with gusto, but it’s always presented through the filter of Oliver. He is shown feeling grief, but we feel nothing. We’re given the memory of this grief, but it is the grief of a man looking at himself and thinking “where did I go wrong?”. I would dearly have liked to feel sad that Hal had died, but Mills never let me. Any movie with a gay theme and a big name cast like this is going to get a special kind of attention from the outer limits of media. Beginners has been well received, and that’s the mystery: there’s really nothing to it. We’re bathing in misery which is only occasionally leavened by imagined subtitles from Oliver’s dog. Beginners has nothing to say about romantic relationships, nor does it explore the particularly fascinating reality of a man finally allowing himself to be gay at 75. A guy is sad, his father was happy. Guy continues to be sad, maybe thinks he shouldn’t be sad any more but he’s not sure. You don’t have to like Beginners. It’s not really that good a film, tackling important and interesting issues in the least engaging way possible. Mike Mills was perfectly suited to make this film but he failed his material, gazing so far into his own navel that he disappeared into it.